'Shunyer Udyan' is a classic family novel by Shirsendu Mukhopadhyay. He wrote huge novel in Bengali language for teenager and adult person. His writing famous books are- 'Adim, Ivo O Andhokar', 'Bholobasa', 'Phul Chor', 'Nor Narir kotha', 'Pidimer alo', 'Durbin', 'Chokh', 'Jao Pakhi', 'Parthib', 'Kapurush', 'Sei Ami', 'Bangalir Amerika Darshan', 'Gati', 'Din Jay', 'Ghun Poka', 'Rangin Sako', 'Guha Manab', 'Jugal Bandi', 'Fazal Ali Asechhe', 'Ekadashir Bhut', 'Lal Nil Manush', 'Dwitiyo Sattar Sandhane', 'Nicher Lok Uporer Lok', 'Santaru O Jolokanya' etc. 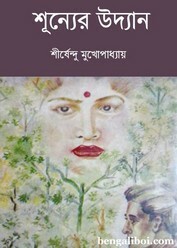 Now I want to share an another popular novel of this author- 'Shunyer Udyan by Shirsendu Mukhopadhyay', the pdf has 146 quality pages, 8mb file size. Collect this extraordinary novel as pdf file from link below. Dear readers can collect the pdf or epub from the certain link which has provided on the above link. Readers have Strictly prohibited to share, download, sell or collecting of any copyright book/ebook pdf for a dishonest purpose. bengaliboi.com has been aware of the copyright act and we want that all readers should obey it seriously. Remember, we don't host any pdf of ebook for this site, we took these PDFs from the web and just for sharing to the thirsty Bengali readers. If any publisher/owner claim about any book for their copyright we will remove the post within 48 hours. We hope all viewers are must agree with this privacy and policy of this ebook site. Thank you.